When I was a kid, we had only one day of Halloween, and it was really just at night. When I was a kid, there was a costume contest, and one kid would actually win instead of all the kids winning a prize for participation. Girls were Raggedy Ann, and boys were Raggedy Andy. When I was a kid, life wasn’t always fair. Halloween is turning into one of those walk-uphill-both-ways-to-school kind of holidays. Each year that goes by, the holiday of Halloween gets longer. It went from one night in my childhood to several weeks in my daughter’s childhood. In a lot of ways, I’m done with holidays spreading across our already full calendar. I’m overwhelmed by more requirements, more parties and so much candy. But as a queer person, I love Halloween. It can be as long as it wants. I fully accept Halloween season. My daughter is strict about her self-imposed identity as a fancy girl. She talks about it a lot. She wants to be a princess. She is upset that her sperm donor is a boy, because “oh, I really wish he could be a girl!” Girls rule, according to my 5-year-old. And yet, as a monkey in the Halloween parade, she was just a monkey. She didn’t add bows or a skirt or even glittered shoes. For that night, she had a break from her tightly held gender identity and got to just be a kid dressed like a monkey. She liked it so much that she removed the skirt and bows from the leopard costume she had planned for our next Halloween event the following weekend. And yes, she has a few costumes. 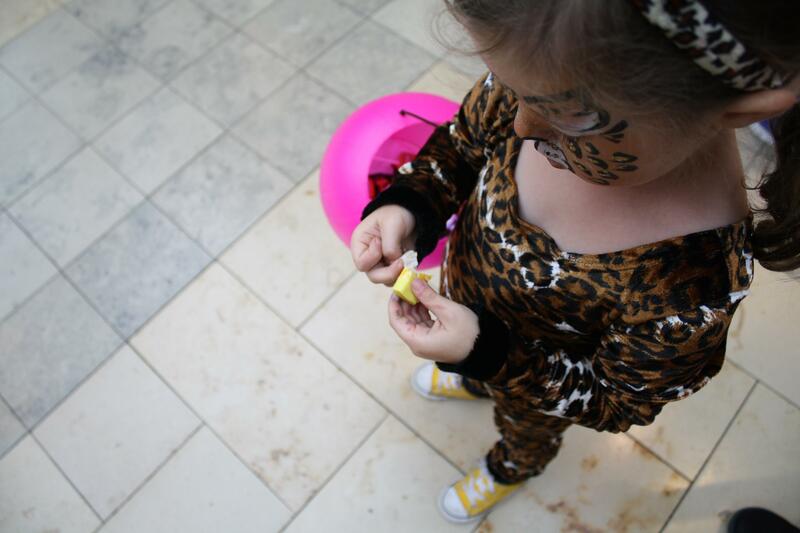 Halloween is often a time for kids (and adults) to use costumes to play with their ideas of gender identity and identity in general, more so now than ever before. Boys can be princesses. Girls can be Ninja Turtles. It hasn’t always been OK, but more and more it is, and that’s a good thing for all of us. Even if Pinterest enthusiasts are making our one-day holidays last a whole lot longer. It just gives us more time to get the most out of it. Soon this Halloween season will be over. Dress-up clothes will go back into the closet; face paint will go back into the drawer. The princess boys will go back to wearing their princess dresses only inside. My daughter will likely go back to her preferred expression of her gender identity, back to exactly who she is, exactly who we love her to be. The genderqueer teenager will put the makeup away until next year. Or maybe not. Maybe this season of public dress-up will give us all a bit more confidence to find our own way and support those around us who are finding theirs. I hope so. For all of us.